I have a friend who gave me his personal business card. On the back, however, was a brief little gospel script. This might be a useful idea for a person to give away, and makes for a little conversational piece. Of course, the script is not complete. It doesn’t explain everything that is contained in the gospel, but not a single script does. This little summary gives a person a conversational piece to fill in the blanks, to adapt to the moment’s context. Thanks to my friend, the Sterlings, in Enfield CT for this image. Add in a URL on here and you can even lead them to a website to learn more than can fit on a business card if they’re really interested. I don’t know if that would be on the front of the card or not, but something separate and non-intrusive would be kind of cool. or maybe your church’s “tell me more” page? Not off the top of my head. It could vary by person or organization. Some might appreciate a local URL on the church page. Some might go for something more generic (www.needhim.com or similar). There are all sorts of possibilities. Something easy to type is always a plus. It just got me thinking that with the small amount of space on a business card, adding a link to get more information would be a bonus. I’ll have to do some more research. There are an awful lot of good “What’s the next step?” type pages. 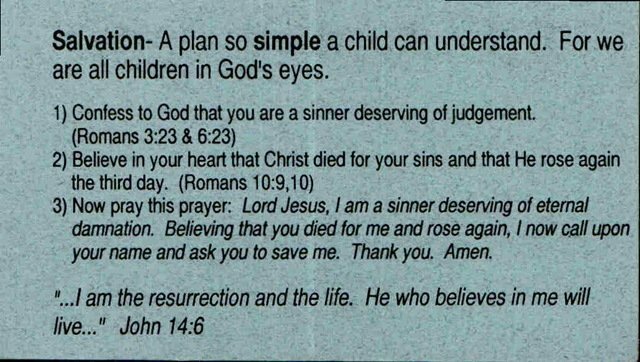 I’d also like to ensure that the page would let the person know that this isn’t some “magic formula” type thing where you say the prayer once, get “saved”, and then resume life as always. We have been chatting about that a little in our SS Class and it’s sadly common that people do just that – say a prayer, walk the aisle, whatever. They then drop off the face of the earth as far as we’re concerned. If a friend, they’ll start avoiding us out of some guilty feeling. 1. Allow for a fuller explanation of the brief content on the card. 2. Indirectly markets the church. 3. Is search engine friendly. 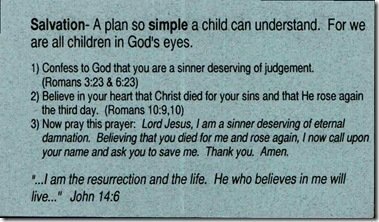 The tell me more page could have an action step to call for a decision of faith, contact the pastor (with telephone number), or perhaps a webform for a free bible. The free bible offer could be presented personally, not via us mail to continue the contact work.